I had never eaten sour cherries until this summer. Given that we have sour cherry trees in the wee orchard of the farmette we bought two years ago, you would think I would have eaten them last year. Last year was pretty craptacular for our fruit trees. We had nearly no apples and not a single pear, based on a late spring frost that damaged all the blossoms (not to mention the pear-loving deer). We had a peach tree, mateless and pathetic, so no fruit there. There were also two plum trees which were the wrong types to cross-polinate with each other. And the sour cherry trees just yielded what looked like pits on stems. Additionally, last year we were new to our farmette and still figuring out how to care for all these trees and plants -- in fact, I spent much of last year simply trying to identify what we had so that I could learn how to care for it. I spent more than one of what I call "What the Hell Is This Day" at the local nursery: I bring in photos of the plants in my yard and ask the nursery workers, "What the hell is this?" But, so far, this year has been better. We're managing pests and diseases, and I've read up on how to care for the orchard. So imagine my delight when the trees actually starting producing fruit that looked edible. While we're still waiting for the apples and pears to mature, the sour cherries hit their stride this month. This was both exciting and daunting for me: exciting, because I would have a personal harvest, and daunting, because I'd never even tasted sour cherries before, let alone cooked with them. Given that we had so many cherries, I decided to try roasting them into a jammy sauce, in much the same way that I made my strawberry-rhubarb jam. Seriously. This stuff is amazing, the perfect blend of sweetness and tartness. It's not quite thick enough to be a jam so I'm calling it a sauce. It elevates a bowl of ice cream from simple snack to astoundingly delicious dessert, worthy of serving to guests. And remember that flourless chocolate cake from earlier this month? Here's another perfect topping for it. We also stir the sour cherry sauce into yogurt with homemade granola for a delicious quick breakfast. And I have no doubt that it could easily find a home on a cheese platter, too. 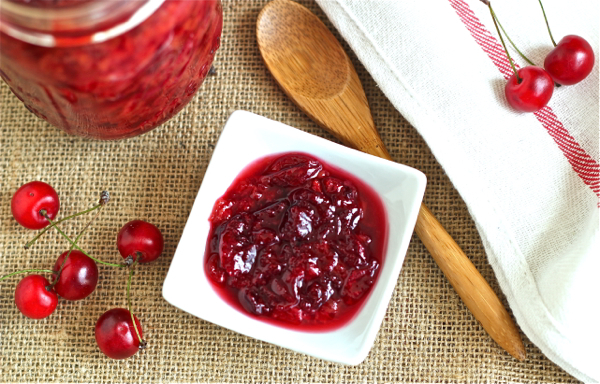 The season is brief for sour cherries so, if you can locate a precious few, this roasted cherry sauce is the ideal way to use them. Do you like sour cherries? 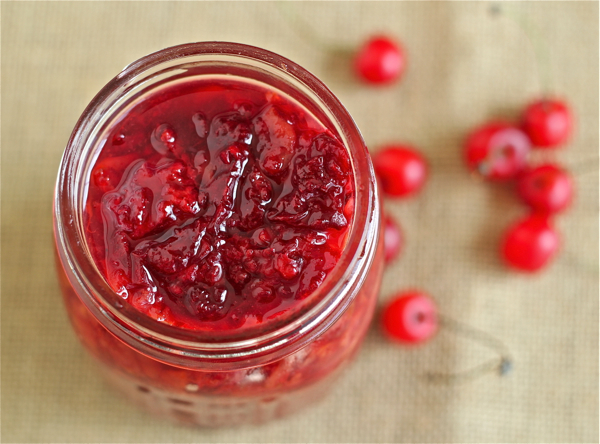 What's your favorite way to eat or preserve them? Leave a comment: The Ninj wants to know. If you like, you could also add some other spices or flavors (lemon zest, cinnamon, etc. ), but I prefer the taste of the cherries all on their own. Preheat the oven to 350 degrees. 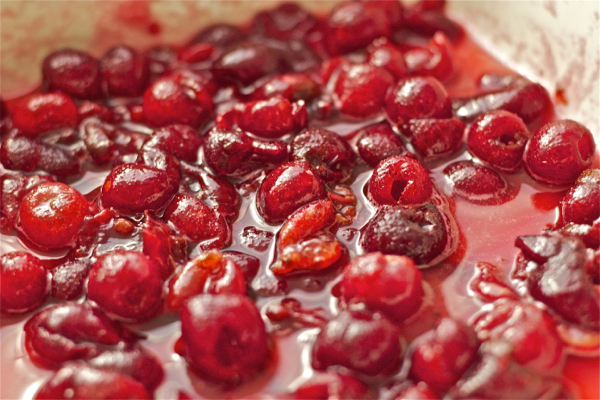 Mix all the ingredients together in a large baking dish and roast for about 30 minutes or until cherries are super-soft. Remove from oven and mix and mash with a potato masher. Cool in the dish and then spoon into jars. Store in the refrigerator or freeze. that looks delicious, and your picture is FABU!!! I'd put some of that on good ham, too. In addition to chocolate cake, of course. I actually have a cake pan that has an indented bottom which forms a sort of bowl just for holding cherries when you turn the cake over. It's especially for Black Forest cakes, and this sounds just marvelous! But if I had that cherry tree, I'd be making lots of cherry pies in a jar. I'd fill freezers full of them! That cake pan sounds perfect for this, Barbara! And don't worry, my freezer is *full* of cherries. How did you get so lucky!!! 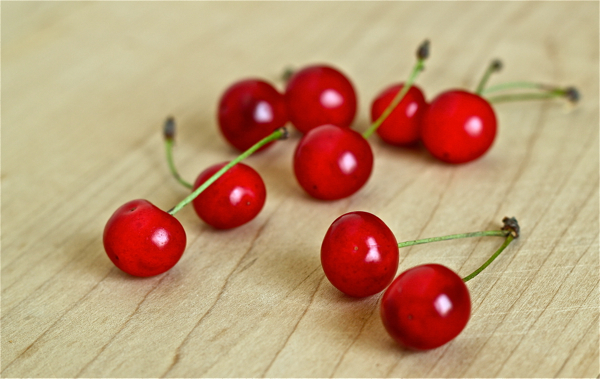 I just tasted tart cherries this summer too and I fell completely in love with them. I have been dreaming about the day I will plant my own trees and then have to wait several years before I get any cherries...ahhhhh...I have no patients I tell ya!!! After makings pints and pints of regular jam I am totally pissed that I didn't think to roast some. I am going to have to start a list for the things I need to make next year. Definitely add the roasted version to your list -- you won't be sorry!